A planning application for the Trump Organisation's bid for hundreds of new homes in Aberdeenshire is being recommended for approval. The plans include the construction of more than 500 homes at Menie, as well as shops, offices and food outlets. There have been more than 2,900 objections. Planners are recommending granting of permission in principle, subject to several conditions, including addressing tree loss concerns. Members of the Formartine area committee will consider the matter on 26 March, before it potentially goes to full council on 25 April. A total of 2,921 representations were received, 2,918 of which were in objection - of which one letter contained a petition with 18,722 names - and three in support. 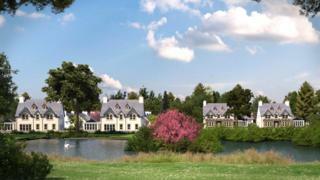 Branded The Trump Estate, the plans feature a range of two, three, four and five-bedroom cottages, priced from £295,000, to larger properties costing more than £1m. In November, it emerged that a council memo described the plans as a "weak substitute" for the original proposals put forward 10 years ago. The plans were now said to be "weighted very heavily" towards residential housing rather than tourism. The Trump Organisation described the remarks in the memo as "naive at best".